In the recent News article about the Pharisee and the Publican we asked two questions. 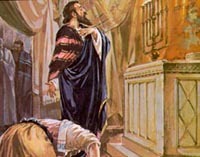 Which is the Pharisee and which is the publican (referred to as a "tax collector") in the picture? Answer: The Pharisee is standing and looking way too proud. The publican is humble and kneeling. What was wrong with the teacher's remark about the too-proud Pharisee? Answer: She was acting a little too proud herself!